Each Easter week I notice a huge spike in the the number of visits to TruthUnity. It's evident that people are trying to get their head around the orthodox explanation of the crucifixion, atonement and resurrection. We in Unity aren't orthodox, and we certainly aren't evangelical. Evangelical Christianity and Metaphysical Christianity are two ends of a continuum—one that stresses separation from God, worshiping Jesus and salvation by confession, another that stresses bondedness with God, following Jesus and salvation by transformation. No one explains Metaphysical Christianity better than Jim Lewis. Jim's background was as orthodox Christian as one can get: he was born in Florida in 1927 to a Southern Baptist family but was later orphaned and spent three years in a Roman Catholic orphanage and high school. He never was satisfied with the orthodox explanation of things. This set him along a life-long journey digging through orthodox theology to find the hidden truths he sensed was there. He eventually found the writings of Imelda Shanklin and then asked "where is her church?" That led him to Unity. Jim became a long-time minister at Unity of Denver, a prolific writer and an insightful theologian. I am so happy that Mrs. Lewis has given me permission to publish the full text of two of Jim Lewis' books. Biblical Favorites has 21 short chapters, each focused on a particular biblical story. Unity students know there are various "levels of interpretation" in Bible study. Jim bridges the practical, historical and metaphysical levels in a way that provides a thorough treatment of each story. Here you have 21 Sunday lessons by a most insightful writer. The Mystical Teachings of Christianity is where you will find Jim's insights into the crucifixion, atonement and resurrection, in addition to a dozen other topics. This is great material for browsing around during Easter week. These chapters will be especially helpful for those who came-up through mainline or evangelical Christianity and who don't quite get the orthodox explanation of things. The full text of both books is out there, each chapter is given its own page. So Google will pick it up and make the text available to those who are searching. I hope you spend some time today and the rest of this week exploring what Jim's lifetime of study has to say about Unity and Christianity. I believe these two books will help frame Metaphysical Christianity for a whole new generation of Unity students. Jim Lewis was born in Florida in 1927 to a Southern Baptist family. He was orphaned and spent three years in a Roman Catholic orphanage and high school. He describes in video clips below how he was introduced to Unity by reading Imelda Shanklin's book "What Are You?" He was ordained by Unity in 1960 and he is likely the 3rd person from the left in the 1960 Unity Ordination photo. 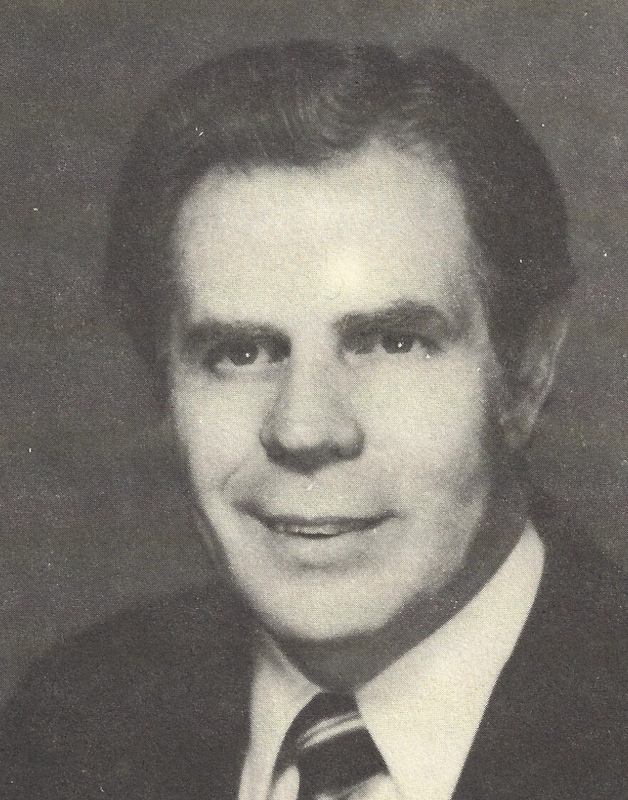 He served six years in Syracuse, New York and in 1965 began his long ministry in Denver. Since ordination in 1960 Jim continued his studies in Religion and Sociology at Syracuse University and Denver University. He received his BA from Denver University in 1967 and his MA from Denver University in 1985. Jim Lewis clips from Spiritual Spectrum show. He is a past President of the Association of Unity Churches. Jim served as Chairman of the Executive Committee of the Association's Board for seven years. He is the author of twelve boks and several cassette albums. Jim has given seminars and spoken in many churches throughout the United States. 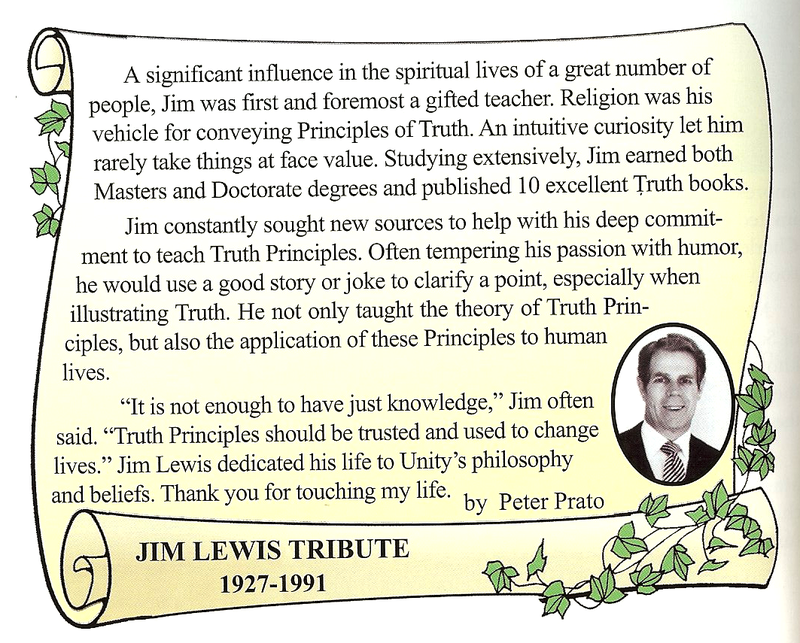 I am so pleased that the family of Jim Lewis has granted permission for TruthUnity to share the text of two books written by him: Biblical Favorites and The Mystical Teachings of Christianity. A significant influence in the spiritual lives of a great number of people, Jim was first and foremost a gifted teacher. Religion was his vehicle for conveying Principles of Truth. an intuitive curiosity let him rarely take things at face value. Studying extensively, Jim earned both Masters and Doctorate degrees and published 10 excellent Truth books. 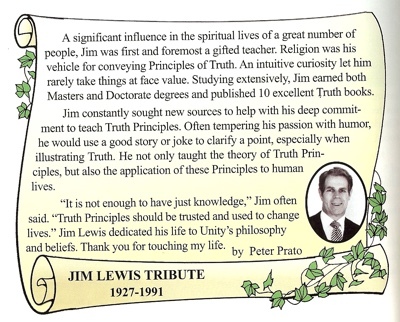 Jim constantly sought new sources to help with his deep commitment to teach Truth Principles. Often tempering his passion with humor, he would use a good story or joke to clarify a point, especially when illustrating Truth. He not only taught the theory of Truth Principles, but also the application of these Principles to human lives. "It is not enough to have just knowledge," Jim often said. "Truth Principles should be trusted and used to change lives." Jim Lewis dedicated his life to Unity's philosophy and beliefs. Thank you for touching my life.